Next time you cross a bridge over a slow moving, weedy river, look carefully into the water – there may be a monster lurking there. See its huge head, its rows of sharp teeth, the green-grey shimmer of its powerful, muscled back. It’s a pike. 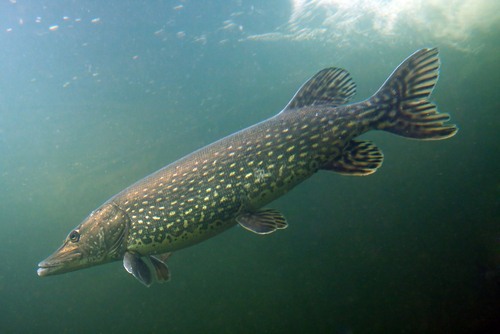 Pike are our freshwater sharks, hiding among the reeds ready to launch out at unwary prey. They aren’t fussy eaters – fish, frogs, ducklings are all fair game. Pike can grow to truly monstrous proportions. A fish caught in Loch Lomond in 1947 weighed 47lb 11oz (21.6kg). Despite their size they are not easy to spot because of their habit of hiding in the water weeds. You need a warm, dry, still day when the water is clear, and the patience to wait and watch. Buy copies of our informative guides, inspiring DVD film and attractive branded clothing. 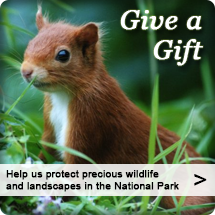 Proceeds will help to protect the Park's natural and cultural treasures. Shop online now. From as little as £12 help plant native trees with protective tubing and stakes to restore some of the Park's special landscapes. Click here to donate online. Any natural place contains an infinite reservoir of information, and therefore the potential for inexhaustible new discoveries.